E & E Waste are contracted by Council to provide a fortnightly recycling kerbside collection service to residents and commercial customers. According to the Australian Bureau of Statistics, every Australian contributes around two tonnes of waste each year - a mixture of household garbage and industrial waste created by things we buy or use. It's becoming more difficult and expensive to find new refuse tips for waste. Waste disposal is a major issue for the government and the community. By avoiding and reducing waste, and re-using and recycling, we aim to cut waste by up to 50 percent. Please place all materials in bin loosely - not in plastic bags. Ensure all containers are empty. It's best if you remove lids. You don't have to remove staples or envelope windows. View our A-Z brochure with helpful tips of what rubbish can go into recycling bins (yellow lid), general waste bins (red lid) and at our local landfill sites. The contents of your recycling bin (yellow lid) are sorted on a series of conveyor belts, magnets, eddy currents, trommels (big sieves) and by hand. Placing non-recyclable waste in the recycling bin can hinder the recycling process or cause a lower grade product to be produced in the manufacturing process. It is important to make sure that only recyclable items are placed in the recycling bin. Placing incorrect items in the recycling bin is called 'contamination'. Contamination causes problems during the sorting of recyclables, as well as affecting the ability of the item to be processed into a new product. In some cases, just a few contaminated bins can ruin an entire truckload of recyclables. Just a few people doing the wrong thing can lead to such a waste! Make sure your efforts count- RECYCLE RIGHT!! Plastic bags are the most common contaminant found in recycling. Remember plastic bags cannot be placed in the recycling bin - they should be reused, returned to a supermarket with a special plastic bag recycling station, or disposed of in your general waste (red lid) bin. It is also important that you remove the lids from jars and plastic bottles and give containers and bottles a quick rinse out before placing them in the recycling bin. Do not place dangerous or unsanitary items into your recycling bin. Goondiwindi One Zero Communications participate in Mobile Muster for mobile phones. Recycling is only one strategy for reducing waste and its harmful impact on the environment as well as the rising cost of managing waste. There are other strategies that you can implement in your home, workplace and school that will make a significant difference to the waste ending up in our landfill. 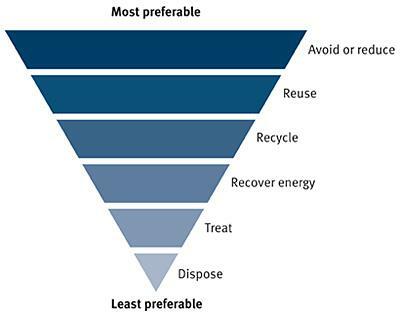 The following table demonstrates the waste management hierarchy. Reduce—Avoid waste-look for ways to produce and use goods that stop waste being generated. Reduce waste-choose products that can be used productively, recycled locally, and have minimal packaging. Re-use—Re-use containers, packaging or waste products. Recycle—Recycle waste material into useable products.